The best electric guitars set high standards for all others in terms of their sound and construction. These fine instruments complement the top-notch playing ability of star guitarists all over the world. They shape the development of modern music, becoming standards that are sought after by skilled musicians everywhere. The Fender Stratocaster, known as the Strat, has been continuously manufactured since its debut in 1954. MusicRadar praises the Strat for its double cutaway design, which gives guitarists easy access to the entire fretboard. With its three single-coil pickups, its sound is immensely versatile and is used in rock, jazz, heavy metal, and rhythm and blues. The likes of Jimi Hendrix, Stevie Ray Vaughan, and David Gilmour have all considered the Strat their signature guitar. The Fender Telecaster, or Tele, burst on the music scene in 1950 as the first dual pickup, solid-body electric guitar to be widely produced. MusicRadar raves about how the American Standard Telecaster, one of the Tele models currently in production, features an exceptionally warm tone that's enhanced by custom shop pickups. Its neck is flatter than vintage models, enhancing its playability. The Telecaster is widely used in rock and country music, and enthusiasts have included Waylon Jennings and Bob Dylan. One of the most celebrated electric guitars in the world, the Gibson Les Paul has been played by such luminary guitarists as Jimmy Page and Jeff Beck. The Les Paul introduced the humbucker pickup which revolutionized rock and roll. Guitar & Bass Magazine gives kudos to the Les Paul Standard for its chambered body that makes the guitar lighter and adds resonance to its tone. The neck is thicker on the low end and thinner on the high end, making the guitar easy to handle and play. Thanks to guitarists like Buddy Holly and Pete Townshend, the Gibson SG Standard has earned its place as an icon. Gear & Guitars gives a thumbs-up to the SG Standard, which has a thinner body than the Les Paul. Its lighter weight and double cutaway shape lend itself to innovative playing techniques. Guitarists will be pleased with the SG Standard's two humbucker pickups, as well as its angled headstock, all of which give its tone extra resonance. The Beatles were perhaps the greatest enthusiasts of the outstanding Rickenbacker 300 Series, ensuring this line of instruments a permanent place on any list of the greatest guitars. One of the most well-known of the 300 series is the Rickenbacker 360, which is available in both 6-string and 12-string models. 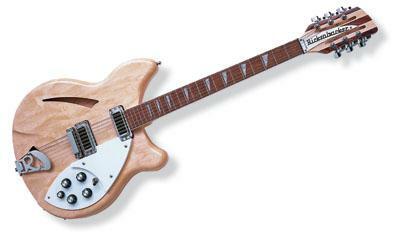 One Time Experience praises the Rickenbacker 360 for its jangly tone. Its body is semi-hollow, amplifying its distinctive sound and really making it sing. Guitarists have Steve Vai to thank for the Ibanez Jem. The legendary guitar player designed this signature series according to his specifications. MusicRadar waxes enthusiastic about the Jem, one of the best guitars around for rockers who love speed playing. It features an aggressive, double cutaway design, a slim, ergonomic neck, and strings that sit low on the body for easy bending. The tremolo is truly remarkable and lets guitarists go up a whole fifth. The Ibanez S Series took off in the 1980s, right along with the popularity of heavy metal. These guitars are manufactured out of top-grade mahogany but are still on the light side. One Time Experience dubs the Ibanez S Series nothing less than legendary. Highly-skilled guitarists will love the S Series' 24-fret neck, also known as the Wizard Neck because of how its slim, flat design enhances the guitar's playability almost magically. The Ibanez S Series also features a sturdy tremolo system that helps keep the instrument in tune. The Paul Reed Smith Custom 24 is often considered to be a guitar that blends the best features of the Stratocaster with those of the Les Paul. The PRS Custom 24, a top-of-the-line instrument, garners kudos from DV Magazine for offering a 24-fret fingerboard constructed of rosewood. An excellently-integrated humbucker pickup system on both the neck and the bridge gives the guitar a vintage sound. The Paul Reed Smith McCarty 58 was designed to honor Ted McCarty, an innovative guitar designer. Ultimate Guitar users write glowingly of the PRS McCarty, which was made famous by Carlos Santana. It features a clear, distinctive tone that sounds great at any volume, run through any amplifier, and with any playing style, making it a superbly versatile instrument. The McCarty's thicker neck gives its tone a particularly pleasing depth. ESP based its design of the Kirk Hammett Series on the custom model guitars owned and played by Metallica's lead guitarist, Kirk Hammett. Guitar World notes that the ESP Kirk Hammett Series is a great instrument for heavy metal guitarists, with its emphasis on playability at screaming speeds. These signature guitars feature double-cutaway designs, locking tuners, and a unique, hard-driving sound. Numerous factors go into the creation of a winning electric guitar, such as high-quality construction, easy playability, and reliability over a period of many years. Serious musicians will want to acquire serious instruments to maximize their investments and raise the bar for their playing. A skillful guitarist, combined with a winning guitar, equals a match made in music heaven.